Stacy has an amazing court presence! She was running the court, diving for balls, and executing spikes with a full approach. Despite her continuous laughter, she remained focused while on the court and was communicating with her teammates like a pro. 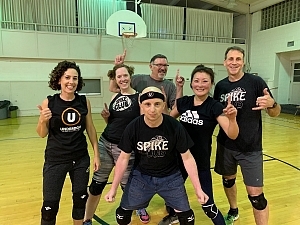 All together, Spike Club's group dynamic was tons of fun and they were able to execute deadly three touch plays. Spike Club is again going to be an exciting team to watch this season and Stacy's energy and skills will make them a tough competitor. Great job team!